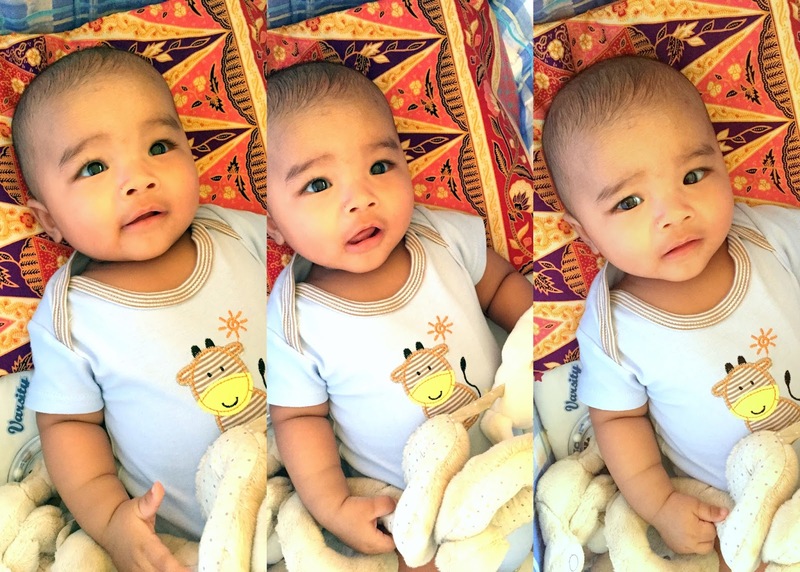 Rayyan at 4.5 months | escaped. My baby's turned 4 months old! He drinks a lot. Like, a LOT lot that he now weighs 7+ kg at only 4 months old! The doctor said he's above average - everything about him is above average; his weight, height and brain. Not my gene obviously WTF haha. And he likes to chew everything, specifically his fingers (or thumb). We got him the French-famous Sophie the giraffe so that he'd leave his poor fingers alone (or maybe because I got tired of wiping his saliva off his hands 24/7 -_-") but he looked at that thing as if it's no different from a wall to him. He'd happily chew his fingers instead, so I guess I'm going to have to wait and introduce Sophie more constantly to him. This boy, I realize is difficult to impress, toy-wise. He laughs at our jokes now. But really, ever since in pantang, he was always such a happy baby - it wasn't difficult to see him smile or hear him giggle, and the first time I heard him giggled I felt as if my uterus just burst with happiness. He'd giggle at me tickling his tummy, or when his daddy holds him high up in the air and yells "superbaby", or when we make funny noises - sometimes even when strangers try to play with him (when he's not moody or hungry). Everyone keeps asking me if I used to smile a lot during pregnancy lol. But now, he's turned grumpy especially around strangers I don't know why. Usually he's not even in a bad mood, it's just..an expression he tends to make. He's more of an observer than a talker, too. He babbles a lot when he's with us (especially in the middle of the night T.T), making all sorts of noises a baby can make, but around people, he'd go silent. If you're lucky enough to be around him when he's in an exceptionally good mood or if he likes you enough, he'd babble his life away, there's no stopping him. Nowadays, when I come home from work, he'd always be the first person to greet me at the house. And we would cuddle together in bed, playing with his soft toys while waiting for Shahrul to come home from work. My favorite time of the day so far! so comel~~ his eyes are my favorite! nampak muka zatil time kecik2 kat 'you might also like'. serius anon rasa muka rayyan habis. bentuk mata both rayyan and zatil (dlm pic masa kecik tu) nak kata sepet pon tak la jugak, but ada la mcm chinese sikit. mmg ada chinese blood ke? haha. yayy! takdelah, pure melayu lol but I get that question a lot hehe.